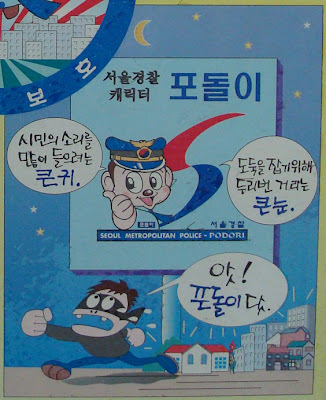 Here's more about Podori, the New Police for the New Millenium! 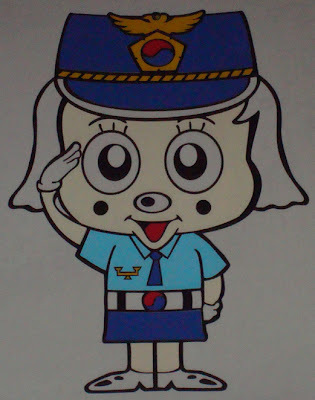 Podori is the mascot for the Korean National Police Agency. He has been presented on Korea & Animation before. Here is what has been learned about him since then. 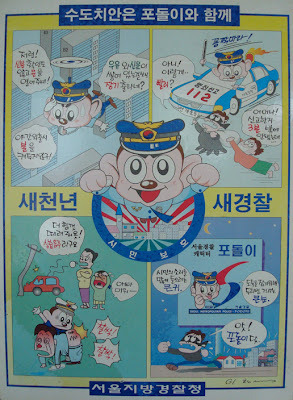 This sticker was placed by the Seoul Police Department inside of a subway station. Look very closely at the lower right-hand corner and you'll see the signature of Lee Hyeon Se. 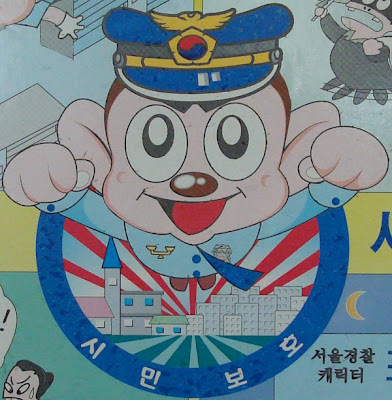 Lee, often upheld as the most famous comic book artist in Korea, apparently designed Podori. 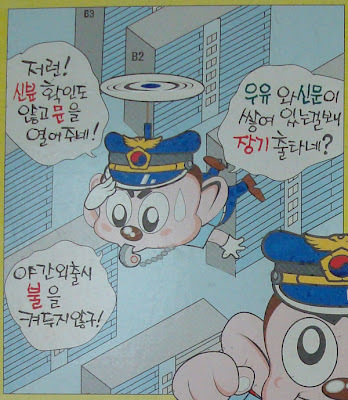 It appears Podori can patrol Seoul apartments by flying around with a Doraemon-like helicopter cap. Here he is observing how careless Seoul citizens are. Podori: Wow, they don't even bother identifying their guests before opening the door! Podori: Milk and newspapers are stacked up outside. They must have been gone for a long time. Podori: They don't turn off the light while out at night! Podori is a very respondent police officer. Crook: Oh! That was so fast! Woman: Oh my! It's only 3 minutes after I reported this! Podori isn't afraid to put troublemakers in their place. Angry Wife: Beat him! Spank him harder! Because he's an alcoholic! Upset Daughter: I hate my dad! Watch out criminals, because Podori is watching you even more closely! Podori: Big ears to better hear citizens. Podori: Big eyes to better catch thieves with. And here's a treat. The other police mascot! Although, she isn't seen around as much as Podori. I wonder what her story is? 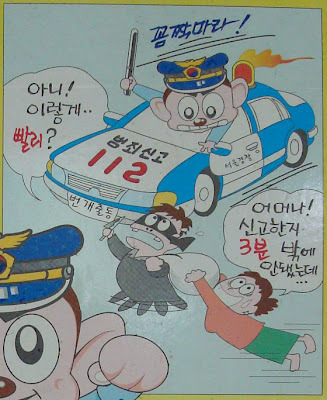 I hope the female police officer is also featured in Korea ads! Thanx for dropping by and leaving a comment on my blog. I dont know about the characters you have mentioned but glad you liked the 'Blue Monster'. I like the post about Podori. It would be nice if Indian Police also adopts a mascot. Helly, unfortunately, she doesn't get the same attention as Podori. Spotting her is rare. Helterskelterrr, you definitely have the design ability! You should propose one to the Indian Police Department. Tell them that China, Korea and Japan all have a mascot, so why shouldn't India? That would be cool! 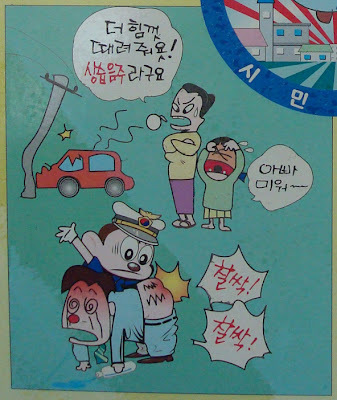 You might be sued by Korea police. If so, I will help you out!!!! !